The Health & Safety Executive (HSE), the national regulator for workplace health and safety, has given its support to a national safety campaign running this month (October 13 - 19 ). Campaigners have declared a period of action in a bid to dramatically improve the safety of automated gates in the UK. 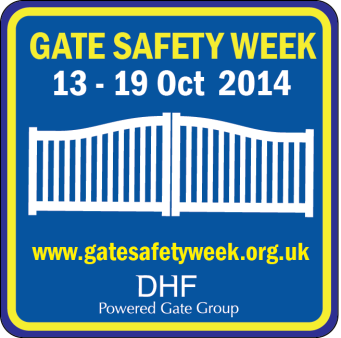 “HSE supports Gate Safety Week, DHF and all those involved in ensuring the safety of powered automatic gates. Gate Safety Week is being organised by the Door & Hardware Federation (DHF) Powered Gate Group which comprises Britain’s leading manufacturers, suppliers, installers and maintainers of powered automatic gates and gate automation equipment. The DHF originally set up its Powered Gate Group with the encouragement of the HSE following fatal accidents involving unsafe gates. In recent years, three children and three adults have been killed in gate accidents. It is estimated there are more than 500,000 automated gates in service in the UK, yet as few as 10 per cent of these are safe to use. HSE inspector Stuart Charles, who led the investigation into the tragic death of a child in a South Wales automated gate accident, will be the keynote speaker at an event being attended by a number of safety and security specialists, gate manufacturers, installers and gate specifiers. His presentation on Wednesday, October 15 will major on the accident in South Wales where a five-year-old girl tragically died after being crushed between the closing edge of a gate and the gate post. The two gate companies involved in the repair and maintenance of the gate were found guilty of serious safety failings and were heavily fined. The Gate Safety Week campaign is stressing that properly installed and maintained gates are perfectly safe to use. There is comprehensive guidance for safety experts, other professionals and the general public on the website www.gatesafetyweek.org.uk. This includes a guide to safety legislation and a detailed run down of the safety features to look for on a powered gate.